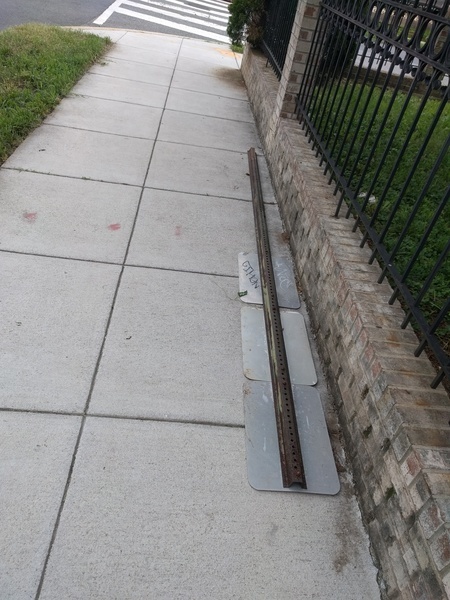 this parking sign has been knocked over and needs to be replaced. Thank you for submitting your service request (SR #18-00337220). You will receive an email when your request has been addressed by the servicing agency (DDOT). The No Parking Anytime sign was removed. The towing company across the street constantly park in the no parking anytime area. Please replace ASAP and please patrol area for constant Illegal parking. Have a blessed day. Thank you for submitting your service request (SR #18-00336806). You will receive an email when your request has been addressed by the servicing agency (DDOT). Please remove the shield as it is dark in the alley. There is no need for a shield to be on this post as it is a normal light and not LED! Please remove! I am not comfortable walking my dog with not enough lighting in this alley. If you are going to keep the shield, please change the light to LED. Thanks. Thank you for submitting your service request (SR #18-00329264). You will receive an email when your request has been addressed by the servicing agency (DDOT). Thank you for submitting your service request (SR #18-00313701). You will receive an email when your request has been addressed by the servicing agency (DDOT).